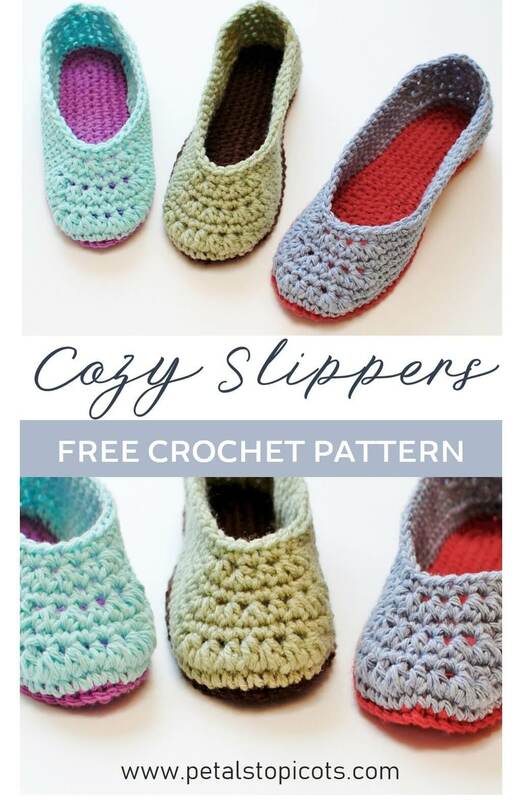 Home > Crochet > Free Crochet Patterns > Crochet Slippers – A Free Crochet Slipper Pattern! 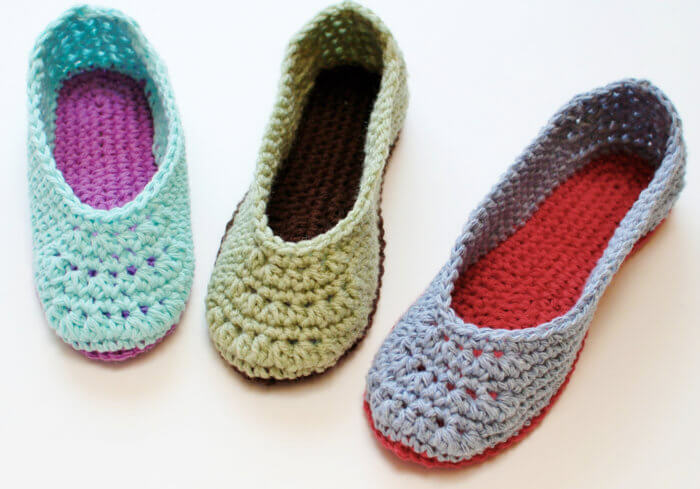 I’ve included four variations of the pattern below for slipper sizes to fit U.S. ladies sizes 4/5, 6/7, 8/9, and 10/11. Available as a convenient, ad-free and printer friendly pdf download here. Notes: The pattern below includes women’s sizes 4/5 (6/7, 8/9, 10/11). See changes for each size in parentheses. Gauge: 14 scs and 16 rows = 4 in. With CA, ch 18 (21, 24, 27). Round 1: Work 2 sc in 2nd ch from hook, 1 sc in each of next 10 (11, 13, 14), 1 hdc in next, 1 dc in each of the next 4 (6, 7, 9) ch, 5 dc in last ch, working along opposite side of ch, work 1 dc in each of the next 4 (6, 7, 9) ch, 1 hdc in next, 1 sc in each of the next 10 (11, 13, 14) ch, 2 sc in same ch as 1st sc of round, join in 1st sc, do not turn — 39 (45, 51, 57) sts. Round 2: Ch 1 (does not count as st), 1 sc in same st as join, 2 sc in next, 1 sc in each of the next 9 (10, 12, 13) sts, 1 hdc in next 7 (9, 10, 12) sts, 2 hdc in next, 3 hdc in next, 2 hdc in next, 1 hdc in next 7 (9, 10, 12) sts, 1 sc in next 9 (10, 12, 13) sts, 2 sc in next, 1 sc in last, join in 1st sc, do not turn — 45 (51, 57, 63) sts. Round 3: Ch 1 (does not count as st), 1 sc in same st as join, 2 sc in next, 1 sc in each of the next 19 (22, 25, 28) sts, 2 sc in next, 3 sc in next, 2 sc in next, 1 sc in each of the next 19 (22, 25, 28) sts, 2 sc in next, 1 sc in last, join in 1st sc, do not turn — 51 (57, 63, 69) sts. Round 4: Ch 1 (does not count as st), 2 sc in same st as join, 1 sc in each of the next 21 (24, 27, 30) sts, 2 sc in next, 1 sc in next, 2 sc in next, 3 sc in next, 2 sc in next, 1 sc in next, 2 sc in next, 1 sc in each of the next 21 (24, 27, 30) sts, 2 sc in last, join in 1st sc — 59 (65, 71, 77) sts. If using a second color for the upper, fasten off and join CB in same st as join, turn. Round 1: Ch 1 (does not count as st), working in back loops only, work 1 sc in same st as join and each st around, join in 1st sc, do not turn — 59 (65, 71, 77) sts. Round 2: Ch 2 (counts as hdc), working through both loops again, work 1 hdc in each of the next 5 (5, 6, 6 sts), 1 sc in next 17 (20, 22, 25) sts, hdc2tog 3 times, 1 hdc in next, hdc2tog 3 times, 1 sc in next 17 (20, 22, 25) sts, 1 hdc in each of the last 6 (6, 7, 7) sts, join in the top of the beg ch, do not turn — 53 (59, 65, 71) sts. Round 3: Ch 2 (counts as hdc), work 1 hdc in next 2 (2, 3, 3) sts, sc2tog, 1 sc in each st around until 5 (5, 6, 6) sts remain, sc2tog, 1 hdc in last 3 (3, 4, 4) sts, join in the top of the beg ch, do not turn — 51 (57, 63, 69) sts. Round 4: Ch 2 (counts as hdc), work 1 hdc in each of the next 5 (5, 6, 6) sts, 1 sc in next 13 (16, 18, 21) sts, hdc2tog 3 times, 1 hdc in next, hdc2tog 3 times, 1 sc in next 13 (16, 18, 21) sts, 1 hdc in each of the last 6 (6, 7, 7) sts, join in the top of the beg ch, do not turn — 45 (51, 57, 63) sts. Round 5: Ch 2 (counts as hdc), work 1 hdc in next 2 (2, 3, 3) sts, sc2tog, 1 sc in each st around until 5 (5, 6, 6) sts remain, sc2tog, 1 hdc in last 3 (3, 4, 4) sts, join in the top of the beg ch, do not turn — 43 (49, 55, 61) sts. Round 6: Ch 2 (counts as hdc), work 1 hdc in each of the next 4 (4, 5, 5) sts, 1 sc in next 10 (13, 15, 18) sts, sc2tog, hdc2tog 2 times, 1 hdc in next, hdc2tog 2 times, sc2tog, 1 sc in next 10 (13, 15, 18) sts, 1 hdc in each of the last 5 (5, 6, 6) sts, join in the top of the beg ch, do not turn — 37 (43, 49, 55) sts. Round 7: Ch 2 (counts as hdc), work 1 hdc in each of the next 3 sts, sc2tog 2 times, 1 sc in each st around until 8 sts remain, sc2tog 2 times, 1 hdc in last 4 sts, join in the top of the beg ch — 33 (39, 45, 51) sts. Because feet come in different widths and half sizes, and every yarn produces a slightly different gauge, it is difficult to have slipper pattern that can ensure a perfect fit for everyone. Therefore, I am including a few tips to customize the fit to be perfect for you. It is actually perfect if the slipper is a bit snug at first. Since yarn stretches, it will quickly conform perfectly to your foot. Sole, Round 2: Ch 2 (counts as st), 2 hdc in next, 1 hdc in each of the next 9 (10, 12, 13) sts, 1 dc in next 7 (9, 10, 12) sts, 2 dc in next, 3 dc in next, 2 dc in next, 1 dc in next 7 (9, 10, 12) sts, 1 hdc in next 9 (10, 12, 13) sts, 2 hdc in next, 1 hdc in last, join in top of beg ch, do not turn — 45 (51, 57, 63) sts. Upper, Round 7: Ch2 (counts as hdc), work 1 hdc in next, sc2tog 3 times, 1 sc in each of the next 6 (9, 12, 15) sts, sc2tog, 1 sc in each of the next 5 sts, sc2tog, 1 sc in each of the next 6 (9, 12, 15) sts, sc2tog 3 times, 1 hdc in last 2 sts, join in top of beg ch — 29 (35, 41, 47) sts. 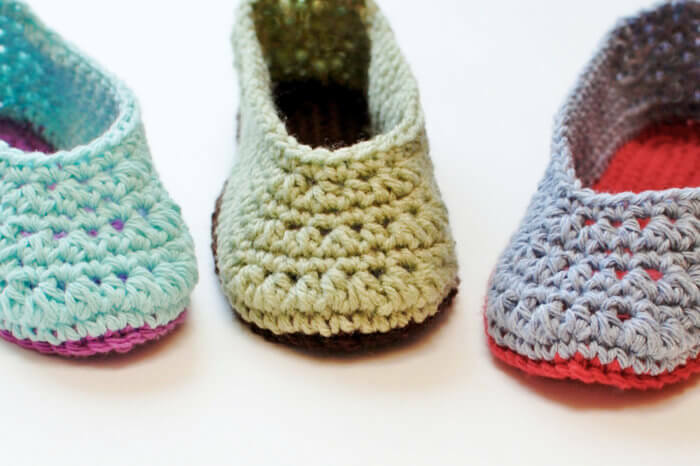 Now that you’ve made a pair of cozy and perfectly fitting crochet slippers, you will want to make them last. 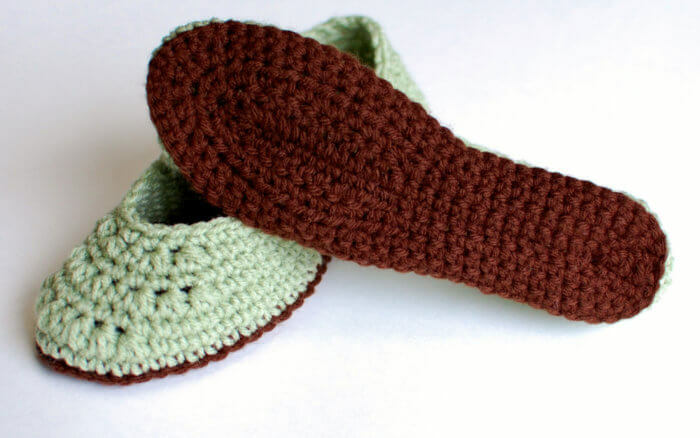 The good news is that you can always crochet up another sole if your sole starts getting warn. One of my secret weapons in also elastic yarn thread. If the tops of your slippers start getting loose, weave some of the elastic thread through the stitches around the top opening to tighten it back up yet still allow some stretching. I love this trick for socks too. Hi Milinda 🙂 Was your stitch count correct for Round 2? There are only 2 decreases in Round 3 of the upper so if you had 59 sts at the end of Round 2, you should have 57 at the end of Round 3.